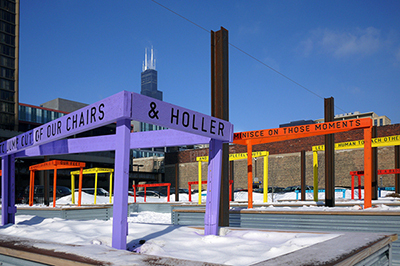 The Center for Book and Paper Arts Papermaker’s Garden at Columbia College Chicago welcomes its inaugural public art project by notable artist and designer Matthew Hoffman. His installation of 15 brightly colored camp signs that feature text fragments is exemplary of his many earlier public installation projects at venues such as Pitchfork and Comfort Station. While the warm colorful palette is playfully subversive against a late winter backdrop, it is the affirming language of the signs that opens up a real dimension for poetic engagement. Thank yous go out to everyone in the InterArts department who slung a screw gun, nail gun, or slege hammer in Chicago’s notorious winter weather: April Sheridan, Kelly Schmidt, MaryClare Butler, Brett Brady, Amy Leners, Angela Davis Fegan, Jillian Brushchera, Brent Koehn, Leo Selvaggio, Justin Botz, & Yihan Chang.